Haverhill and Methuen were among the communities formally awarded state grants Friday to undertake energy conservation measures and clean energy projects. 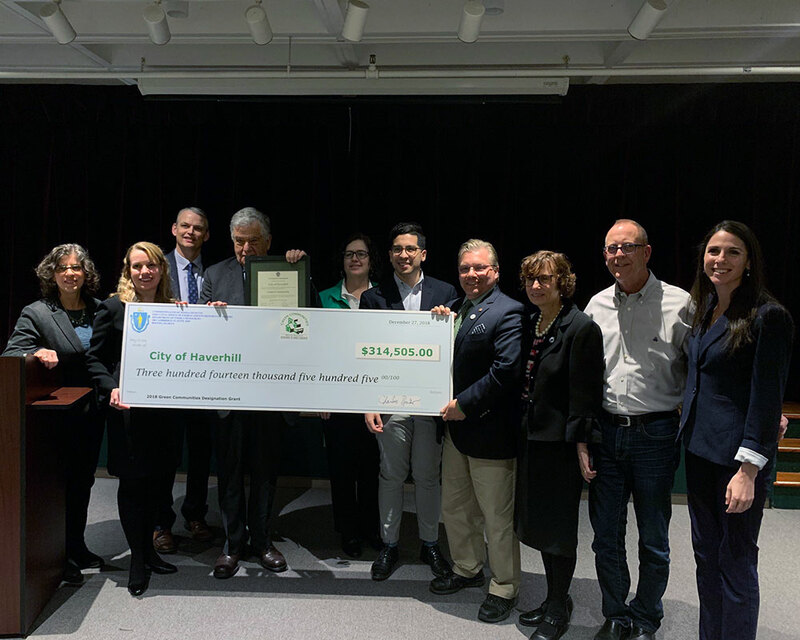 As WHAV first reported in December, the cities have been designated as “Green Communities.” Haverhill was awarded $314,505, while Methuen received $268,640. The awards were presented by Department of Energy Resources Commissioner Judith Judson during a ceremony at Haverhill Public Library. “With 240 of the Commonwealth’s municipalities having earned their Green Communities designation, 78 percent of residents now live in a Green Community,” a statement reported. Since the program began in 2010, the energy division has awarded more than $100 million in grants to the Commonwealth’s cities and towns through designation and competitive grant rounds. Besides Haverhill and Methuen, the Baker-Polito administration gave Green Communities designation grants to Billerica, Boxford, Dracut and Merrimac. “Cities and towns that participate in the Green Communities program have access to additional resources help facilitate investments in energy efficiency and renewable energy projects while reducing energy costs and carbon footprints,” Gov. Charlie Baker said. Under the Green Communities Act, cities and towns must meet five criteria to be designated a Green Community and receive funding, including reducing municipal energy consumption by 20 percent over five years. Back in December, Mayor James J. Fiorentini said the city worked on the application with help from the Merrimack Valley Planning Commission. Besides $300,000 for energy efficiency projects, the mayor said, there is potential for another $1 million over the next five years. As early as March of 2017, Councilor Colin F. LePage advocated for the green designation, having Joanne Bissetta, deputy director of the state Department of Energy Resources, address city councilors.